This is the first game in the Worms series. For other games in the series see the Worms category. This guide is for the original 1995 game. For the Xbox Live Arcade game, see Worms (2007). For the mobile game, see Worms (Mobile). For the unrelated Commodore 64 game, see Worms (Commodore 64). Worms was the first in the series of artillery games developed by Team17 and released in 1995. Whilst initially only available for the Amiga, it was later ported to many other systems. The game was originally created by Andy Davidson as an entry for a Blitz BASIC programming competition run by the Amiga Format magazine, a cut-down version of the programming language having been cover-mounted previously. The game at this stage was called Total Wormage (possibly in reference to Total Carnage) and it did not win the competition. Davidson sent the game to several publishers with no success. He then took the game to the European Computer Trade Show, where Team17 had a stand. Team17 made an offer on-the-spot to develop and publish the game. It subsequently evolved into a full commercial game, renamed Worms, available initially only for the Commodore Amiga computer. As the game was extremely popular, it was regularly released for other platforms including Windows- and Mac OS-based computers, Sega Mega Drive, Sega Dreamcast, Nintendo 64, Nintendo Game Boy, Game Boy Color and Game Boy Advance, Nintendo GameCube, Nokia N-Gage, SNES, Sony PlayStation and PlayStation 2, Sega Saturn, Microsoft PocketPC, and Xbox. During the development of Worms 2, Andy Davidson wrote Worms - The Director's Cut, a special edition produced exclusively for the Amiga. This was, to his eyes, the pinnacle of the series. Featuring weapons not seen in any Worms game before or since, it looks like an enhanced version of the original game. Only 5000 copies were ever sold. It was also the last version released for the Commodore Amiga platform from which the game originated. The references to the developers' home county, West Yorkshire, is visible, with a soundbank named "Tykes", which is a Yorkshire accent, and in the "Hell" level found in the single player mission mode, a sign with "Welcome to Ossett! Ha! ha! ha!" written on it. From the Amiga version: A scrapyard-themed level, with the player using the blowtorch tool. Similar to other early artillery games such as Scorched Earth the game is set on a two-dimensional field. The players control a team of worms, each consisting of four members. The objective is to kill every member of the opposing team(s) within a set time limit per round. Each turn, which lasts from 45 to 100 seconds, a player may move a selected worm and use one or more of the available weapons and tools. The weapons include simple firearms like the shotgun and uzi, alongside a variety of heavy weapons such as the bazooka (the default selection), cluster grenades and airstrikes. The game also includes a number of 'secret' weapons (available through cheat codes on options screens or 'weapon drops' during the game) such as the Banana Bomb and exploding sheep, for which the series has become famous. Also available are various tools such as the 'drill', 'blowtorch' and 'girders' - often used to add protection, adding additional strategy elements. The 'ninja rope', 'bungee' and 'teleport' are also available for greater movement across the playing field. The game's graphics and sound design is primarily 'cartoon-like' (though less so than the later games in the series). Levels designs are randomly generated by the use of alpha-numeric strings. The object and landscape sets used to generate the field are arranged into 'themes' including forests, Martian landscapes, beaches and 'hell'. 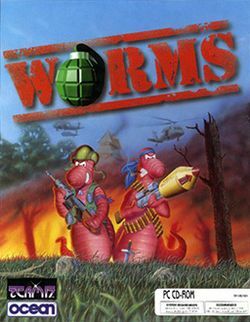 Worms Reinforcements (1996), which was later amalgamated with the original game to create Worms and Reinforcements United (a.k.a Worms United) the same year. Released only for the PC, it added a single player campaign and the ability to add custom levels and soundpacks (which was already available for the Amiga version). It also included an introductory FMV. Worms: The Director's Cut (1997) is the Amiga-only sequel (not an expansion). It is largely built upon the original Amiga game engine with various enhancements, additions and tweaks.